There's still time to send a fun and unique gift that will be remembered! Free upgrade to 2-day delivery at The California Wine Club! Save $21! We're getting into the spirit of the season today, trimming trees and wrapping gifts and humming carols and thinking about last-minute shopping, so let's cut right to the chase for a look at today's featured wine. Fresh from having enjoyed a pretty good Puligny-Montrachet with an indulgent restaurant dinner the other night, I set out to find a White Burgundy that might replicate some vestige of the pleasure without repeating the wallet-flattening price. 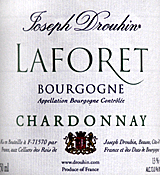 And so it was that I came to an old friend, Joseph Drouhin 2008 "Laforet" Bourgogne Chardonnay. It's a generic white Burgundy that ranks at the bottom of the region's classification, made by one of Burgundy's larger producers for early and casual enjoyment from undesignated grapes that may be grown anywhere in the region. If that sounds like faint praise, let me turn around and say that it's a pretty darn good Chardonnay, appley and crisp, medium-bodied and structured with good, fresh-fruit acidity that stands up very well at the dinner table. Available for $10 or less in some regions (I paid a toll locally in the lower teens), it's about as good a deal as you're going to get in a White Burg. It's no Puligny-Montrachet, but in fairness, it does offer a good, base-level "benchmark" example of Burgundy's way with Chardonnay, and it's well worth the price. FOOD MATCH: The back label declares it "the perfect accompaniment to food," without further qualification. This might be a little broad, but I would certainly enjoy it with chicken or turkey, shellfish or cheese dishes. It went well on our table with a simple, not-very-fiery chicken curry. VALUE: Wine-Searcher.com shows this widely available wine from $9 to $17, with my local porice a bit above the median. It's an excellent buy at $10, decent value in the low-middle teens. WEB LINK: The U.S. importer has a page about the Joseph Drouhin family here. Compare prices and find online sources for Drouhin Laforêt Bourgogne Chardonnay on Wine-Searcher.com. Each gift month is just $35.95 plus shipping and handling, and includes two bottles of award-winning, limited-production wine and an in-depth look inside the featured winery with Uncorked Magazine. Every wine is 100% guaranteed to be one they'll love. Order by Dec. 20, 2010, pay for ground shipping ($13) and get a FREE UPGRADE to 2-Day Delivery! A $21 savings! Send as many months as you wish. Subsequent months will include ground shipping and handling unless otherwise specified. Send more, save more: Special discounts are available on 3, 6, 9, and 12-month gifts. Call 1-800-777-4443 or visit www.cawineclub.com.